RENT’s July report reveals that while prices remained stable across most Australian metro areas, Sydney and Adelaide saw apartment rents languish; prices in the New South Wales and South Australian capitals dropped 1.37 per cent and 3.45 per cent from June to July. House prices also stagnated in Brisbane, dropping 1.2 per cent to $410/week. July’s results follow the recent release of RENT’s Quarter 2 report, which saw price shifts in four out of the eight state capitals across all property types. Considering dwelling type, it was good news for Northern Territory investors, who would have seen a decrease in time on market for both apartments (41 days down from 48) and houses (now 38 days from 42). 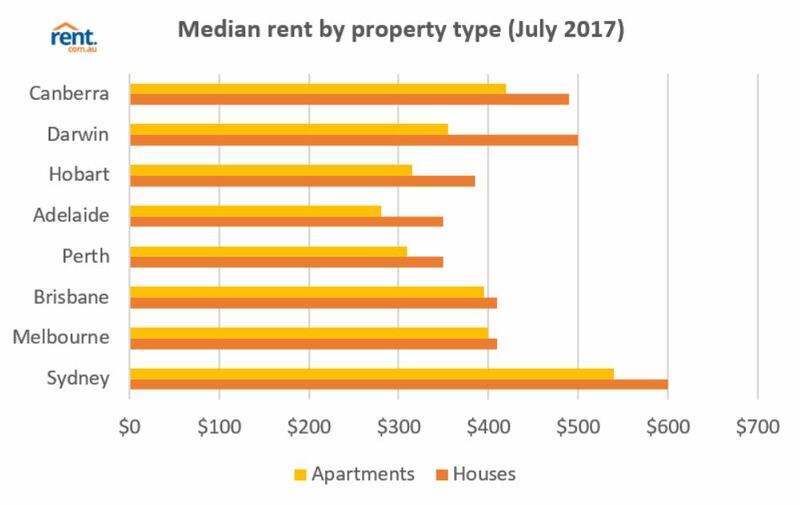 Unsurprisingly, median rents across apartments and houses remained highest in Sydney. Broken down by dwelling type, there was a slight drop in apartment prices in the NSW capital, down 1.37 per cent to $540/week from $547.50/week in June. Canberra apartment prices increased most significantly of all state capitals month-on-month, up 5 per cent to $420/week. Canberra metro was among five state / territory capitals to record an increase in price: Brisbane (now $395), Hobart (now $315), Melbourne (now $400) and Perth (now $310) also made the list. Nationally, house prices rose 1.2 per cent month-on-month, with upward movement seen in Darwin ($500, up 4.17 per cent), Hobart ($385, up 2.67 per cent) and Melbourne($410, up 2.5 per cent). Rents in Adelaide, Perth and Sydney were unaffected from June to July. A price decrease was recorded in only two Australian metro areas: Brisbane houses dropped 1.2 per cent to $410/week and Canberra houses fell 2 per cent to $490/week. Sydney’s house prices have stayed consistent at $600/week year-to-date. Despite no change month-on-month, housing oversupply in Perth has resulted in a gradual price decrease since January 2017. 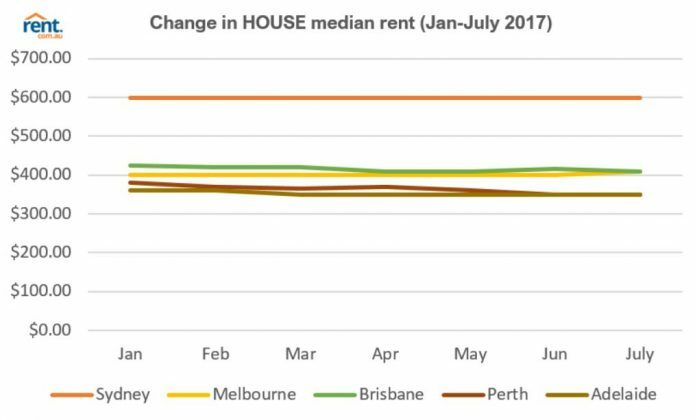 Figures from RENT’s latest report show Perth’s median house price has fallen 7.89 per cent since the start of 2017. Apartment prices in the WA state capital have followed a similar trend: a steady drop from $330/week in January to $310/week in July – down 6.06 per cent. Renters on the hunt for shared accommodation in July would have found the best prices by room in Perth metro – $125/week. Although prices in Perth did rise 2.04 per cent from June, the city has maintained its ranking for ‘cheapest room prices’ with prices lower than all other states since the start of the year. Comparatively, Australia’s priciest rooms were found in Sydney at $275/week. Room prices fell in three metro areas: Adelaide prices decreased 0.65 per cent to $126.70, Darwin dropped 1.54 per cent ($160) and Sydney fell 1.79 per cent to $275. Room prices increased substantially in July for Tasmanian capital Hobart, with rooms now costing $150/week, up 12.5 per cent from $133.30/week in June. Across the country, the median room price was $177.50/week. WA was the only state to record a decrease in regional rental prices in July – down 3 per cent to $320/week. 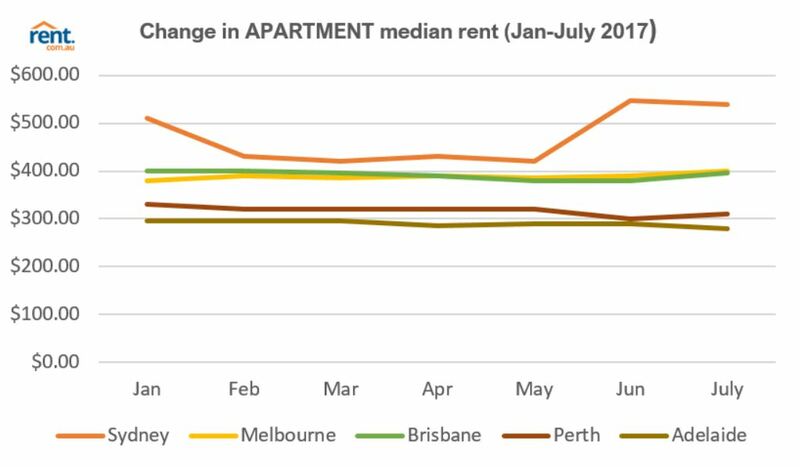 This month’s decrease brings the trend in-line with Perthmetro’s softening rental market. The volume of properties leased in WA’s regional areas also dropped 12.54 per cent in Perth – the most significant of all five major states. The number of regional properties leased recorded an overall drop in volume: SA (-7.39 per cent), VIC (-5.82 per cent), QLD (-4.76 per cent) and NSW down 2.10 per cent. Despite a decrease in volume, prices remained steady in NSW, SA and VIC, while QLD recorded a small increase, up 1.45 per cent month-on-month. Across the country, regional median rents rose 2.94 per cent to $350/week. 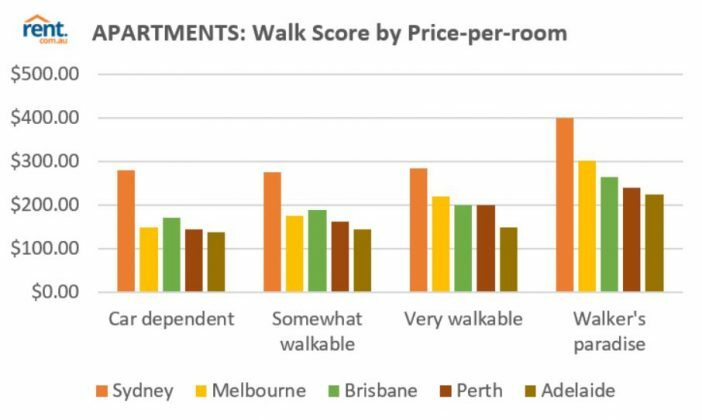 RENT’s July 2017 report compared its Walk Score data to price-per-room data across all leased properties in the month, aiming to identify price trends in areas with varying levels of walkability. 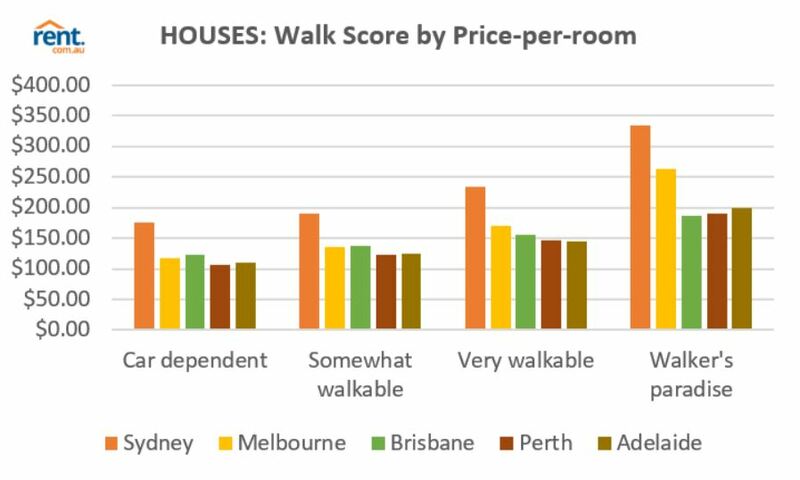 Considering July’s data, the most affordable apartments meeting the Walker’s paradise criteria were in Adelaide ($225/week), while Brisbane took the lead for most affordable Walker’s paradise houses, just $186.70/week. This entry was posted in Australia, Brisbane, ECONOMY FINANCE BUSINESS LJGREALESTATE RENTALS PROPERTY SALES PROPERTY INVESTOR PROPERTY MANAGEMENT, family, finance, LJ Gilland Real Estate Pty Ltd, ljgrealestate, Negative Gearing, property investor, propertymanagement, Queensland, Real Estate, rentals, rentals sales, sales and tagged Australia, Foreign Investment, INVESTMENT, presentation, property, property management, Research, RESOURCES, SALES. Bookmark the permalink.